All paying attendees will receive a free CD of the new Circuline album “Counterpoint”, and your first drink is courtesy of the band, as well as other goodies and surprises. 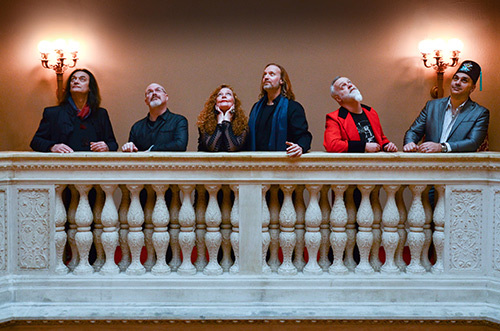 What do you get when you take two theatrical lead vocalists, a keyboard player from Juilliard, a jazz-rock genius on guitar, a bass player from Monster Island, and a drummer with progressive rock in his DNA? The modern cinematic ProgRock band Circuline. Circuline’s newest release, “Counterpoint” (May 2016), features an All-Star lineup of SEVEN guest guitarists: Randy McStine (The Fringe, Lo-Fi Resistance); Doug Ott (Enchant); Alek Darson (Fright Pig); Ryche Chlanda (Fireballet, Renaissance); Alan Shikoh (Glass Hammer); Matt Dorsey (Sound of Contact, Dave Kerzner); and Stanley Whitaker (Happy the Man, Oblivion Sun). The compositional team of Colyer/Brannon returned for this second album, partnered with the songwriting of McStine, and the vocal arrangements of Spillane/Brown/Colyer. In its first few weeks, the album is already garnering praise and new fans. Circuline recently performed at the 13th International Rites of Spring festival (RoSfest) in Gettysburg, Pennsylvania. Additional 2016 gigs include the New Jersey ProgHouse and the Liberty Music Fest in Philadelphia. Circuline has opened for 20-year prog veterans Glass Hammer (east coast U.S. tour), RoSfest 2014 act Elephants of Scotland, and co-headlined the three-day Sonic Voyage Festival with Stratospheerius and Shadow Eden (Top 10 CMJ charting power rock trio). 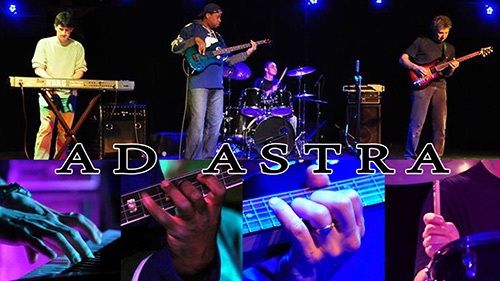 AD ASTRA has been active in the New York City/Long Island music scene for 10 years. Their two CDs of original Prog/Fusion material showcase smooth, thematic playing styles, blending perfectly with soaring, uplifting melodies. Combined with odd and shifting time signatures, you have songs that always keep your interest and never sound monotonous. The the focus is on compositions that are tightly structured, eschewing the bombast and length that progressive rock is known for. Audience response to their live shows has always been very positive, even among people in the crowd who have never heard the band or who are not necessarily fans of the instrumental genre. Currently writing for a third CD, they also spend their time honing their live performances.